For Buying this Product in Other Countries, Please Contact Us. Reaches you within 3 to 5 working days after dispatch! These are suitable in size for our models Standard, Premium and Coupler Harmonium. Of course, these bags can also be used for any other harmonium by other makers as long as these do not exceed the listed sizes. 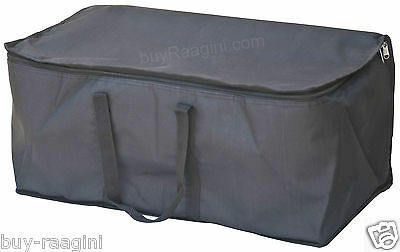 This light Nylon bag is a wonderful way of making a standing harmonium transportable. 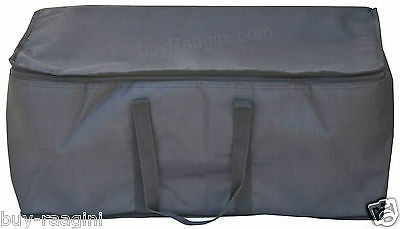 This bag is highly recommended for everyone who has a standard harmonium and needs a great bag for it. Weight: 1 kg approx Material Used This Harmonium Bag has been made using very good quality Nylon Payment Information We only accept payment via PayPal TERMS & CONDITIONS Your item is covered by a free Transit Shipping Insurance. Insurance only covers the main musical Instrument for physical damage only. Insurance not applicable for instrument case or box. Customer must report damages to us by providing all the details of the defect(s) and photographs as soon as possible. Please allow us a maximum of 48 hours to respond to your emails. We will make sure that issue will be resolved as early as possible to your satisfaction. 100% Satisfaction guaranteed. Buyers in all other countries, other than USA, may have to pay some import charges or taxes. For some addresses in Canada & Australia, an additional remote area charge of $35 may apply. You can check your postcode with us. PLEASE RETAIN THE ORIGINAL PACKAGING IF YOU WOULD LIKE TO RETURN THE ITEM! CONTACT INFORMATION You can also contact us at any time to check the status of your order. You can also call us our phone numbers for any questions that you may have. Please note that we will only complete this sale on eBay.